TOKYO - Prime Minister Shinzo Abe pledged Monday the government's utmost efforts to ensure the safety of residents in four western Japan prefectures over which North Korea recently said its missiles could fly en route to waters off the U.S. territory of Guam. 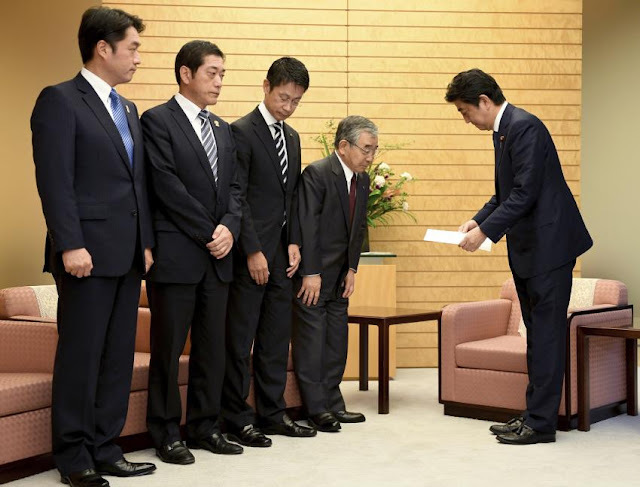 Accepting a written request from Shimane Gov Zembee Mizoguchi urging the central government to take full measures, Abe said at his office in Tokyo, "We will do our utmost (for possible North Korean missiles) not to cause any harm to people." Abe also stressed that the government is seeking to put more pressure on North Korea to stop its ballistic missile firing in cooperation with the United States and South Korea as well as China and Russia. "It's important to have North Korea forgo such an intolerable act," he said. Also participating in the meeting were Hiroshima Gov Hidehiko Yuzaki, Ehime Gov Tokihiro Nakamura and Kochi Gov Masanao Ozaki. North Korea said last week it is "seriously examining" a plan to simultaneously fire four intermediate-range ballistic missiles in an "enveloping strike at Guam." Japan has deployed missile interceptor batteries along the path that North Korean ballistic missiles would fly if the country goes ahead with its threat to fire the missiles toward Guam, which hosts key U.S. military facilities. Air Self-Defense Force Patriot Advanced Capability-3 missile interceptors were deployed in Shimane, Hiroshima and Kochi prefectures, which North Korea said its missiles would fly over, as well as Ehime located between Hiroshima and Kochi. PAC-3 systems are not regularly stationed in those four prefectures. The government has also deployed Maritime Self-Defense Force Aegis destroyers in the Sea of Japan. Japan's missile defense system employs Aegis ships to shoot down airborne missiles and the PAC-3 to counter missiles that evade Aegis interceptors. Tensions have been rising between Washington and Pyongyang since North Korea test-fired two intercontinental ballistic missiles last month.